SANTA MONICA, CA (June 23, 2014) - Leading up to the 2014 NFL Kickoff, Lionsgate will release the thrilling sports drama, Draft Day , on Digital HD beginning August 19, on Video On Demand and Pay-Per-View August 29 and on Blu-ray Combo Pack (plus DVD and Digital HD) and DVD (plus Digital) on September 2. Starring sports movie icon and Academy Award(R) winner Kevin Costner (Best Picture and Best Director, Dances with Wolves, 1990; Bull Durham, Field of Dreams), written by Rajiv Joseph & Scott Rothman, and directed by legendary director Ivan Reitman, the film was made in exclusive partnership with the NFL, allowing unprecedented access to the actual 2013 NFL Draft, an event drawing higher ratings than the playoffs for baseball, basketball and hockey. Featuring an all-star cast including Jennifer Garner (Dallas Buyers Club), Denis Leary (The Amazing Spiderman), Frank Langella (Superman Returns), Sam Elliott (The Big Lebowski), Sean Combs (Monster's Ball), Terry Crews (The Expendables franchise), Houston Texans running back Arian Foster (feature film debut), Tom Welling (TV's "Smallville"), with Academy Award(R) winner Ellen Burstyn (Best Actress, Alice Doesn't Live Here Anymore, 1974) and Chadwick Boseman (42), Draft Day goes behind-the-scenes of the high-stakes, action-packed world of the NFL Draft. It's NFL Draft Day. A day that can change the lives of athletes and the fortunes of football teams forever. After pulling off a blockbuster trade, General Manager Sonny Weaver Jr. (Costner) controls the #1 pick. Up against fan pressure, an ambitious owner (Langella) and a hard-nosed coach (Leary), Sonny faces the biggest decision of his life. Should he go with the consensus #1 pick or trust his instincts and risk losing it all? The Draft Day Blu-ray Combo Pack bonus materials include an exclusive 58-minute "making of" featurette titled "On The Clock: The Making of Draft Day," and "Welcome to Primetime," an inside look behind-the-scenes of the NFL Draft. Both the Blu-ray Combo Pack and DVD special features include audio commentary with writers Rajiv Joseph and Scott Rothman plus deleted scenes. 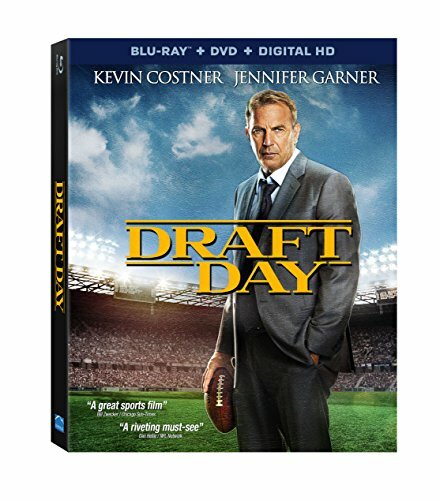 The Draft Day Blu-ray Combo Pack and DVD will be available for the suggested retail price of $39.99 and $29.95, respectively. Title Copyright: Draft Day (c) 2014 Summit Entertainment, LLC and Odd Lot Pictures, LLC. Artwork & Supplementary Materials (c) 2014 Summit Entertainment, LLC. All Rights Reserved. Its feature film business has been fueled by such recent successes as the blockbuster first two installments of The Hunger Games franchise, the first installment of the recently-launched Divergent franchise, Now You See Me, Kevin Hart: Let Me Explain, Warm Bodies, The Expendables 2, The Possession, Sinister, Roadside Attractions' Mud and Pantelion Films' breakout hit Instructions Not Included, the highest-grossing Spanish-language film ever released in the U.S.
OddLot Entertainment is a Los Angeles-based film and television production company that develops, produces, finances and arranges distribution for quality, commercial properties for both the domestic and international markets. OddLot is currently producing Mortdecai starring Johnny Depp, Gwyneth Paltrow, Ewan McGregor, Paul Bettany and Olivia Munn which will be released by Lionsgate, and Jon Stewart's upcoming directorial debut Rosewater. In addition to producing Ender's Game and Draft Day, OddLot also recently produced The Way, Way Back, a comedic drama from Academy Award(R)-winning writers Jim Rash and Nat Faxon, which was acquired by Fox Searchlight at the 2013 Sundance Film Festival and was released in theatres on July 5, 2013. The film stars Steve Carell, Toni Collette, Sam Rockwell, Allison Janney, Maya Rudolph, AnnaSophia Robb, Amanda Peet and Liam James. OddLot's other credits include producing the critically-acclaimed Drive, Rabbit Hole and From Prada to Nada. Past credits for Gigi Pritzker, OddLot's CEO, include The Wedding Planner, Green Street Hooligans and Mean Creek. In March of 2011, OddLot expanded its footprint into foreign distribution partnering with Nick Meyer to create the foreign sales company Sierra/Affinity. This year OddLot commenced a multiyear, multipicture co-financing and distribution deal with Lionsgate which provides both companies a committed framework to co-produce and distribute films.